Quechua and other Amerindian languages spoken by indigenous communities. Ecuador is a small country in South America. It used to be part of the Spanish Empire, because Spain was interested in finding gold in Ecuador. Before Spain, Ecuador was part of the Inca Empire. The president of Ecuador is Lenín Moreno. 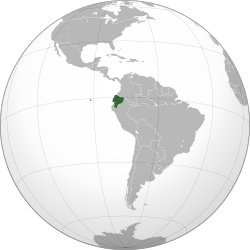 Ecuador is located along the equator. There are jungles and mountains such as the Andes mountains. Ecuador has many active volcanoes and also one of the highest densities of volcanoes in the world. On the coast of the Pacific Ocean there are beaches. The capital of the country is Quito. This city is high up in the Andes, which makes it hard for some new visitors to breathe. The biggest city is Guayaquil on the coast. Cuenca is famous for its old buildings and colonial architecture. Peru borders Ecuador to the south, and Colombia borders it to the north. The Galápagos Islands in the Pacific Ocean are also part of Ecuador and are famous for lots of animals. Charles Darwin travelled to the Galápagos Islands. In 2011, 14,440,000 people lived in Ecuador. The ethnic makeup of the country is: 65% Mestizo, 25% Amerindian, 7% white, and 3% black. Some 27% of the people live below the national poverty line. The official language is Spanish. Many other indigenous languages are spoken. Most of the people in Ecuador are Roman Catholics, although Ecuador has religious freedom and people can follow any religion they choose. Ecuador is divided into 24 provinces. Each has its own administrative capital. The provinces are divided into cantons. The cantons are divided into parishes. The Historic Center of Quito, Ecuador is one of the largest, least-altered and best-preserved historic centers in the Americas. This center was, together with the historic centre of Kraków in Poland, the first to be declared World Heritage Site by UNESCO on 18 September 1978. The Historic Centre of Quito is located in the center south of the capital on an area of 320 hectares (790 acres), and is considered one of the most important historic areas in Latin America.There are about 130 monumental buildings (which hosts a variety of pictorial art and sculpture, mostly of religious inspired in a multi-faceted range of schools and styles) and 5,000 properties registered in the municipal inventory of heritage properties. During the Republican era, almost all the presidents (constitutional, internees and dictators) have dispatched from this building, which is the seat of Government of the Republic of Ecuador. In addition to the administrative units in the third level of the Palace is the presidential residence, a luxurious colonial-style apartment in which they live the President and his family. Rafael Correa, president since 2007, considering that Carondelet Palace and its agencies are Ecuadoran heritages, converted the presidential compound into a museum accessible to all who wish to visit it. To this end, areas were organized to locate objects within their cultural contexts to make them accessible to the world. Several rooms and spaces within the palace are used for this purpose. Construction began in 1605, with Mastrilli laying the first stone. The building was not completed until 1765. La Compañía is among the best-known churches in Quito because of its large central nave, which is profusely decorated with gold leaf, gilded plaster and wood carvings. Inspired by two Roman Jesuit churches—the Chiesa del Gesù and the Chiesa di Sant'Ignazio di Loyola—La Compañía is one of the most significant works of Spanish Baroque architecture in South America. The Iglesia y Monasterio de San Francisco (English: Church and Monastery of St. Francis), colloquially known as El San Francisco, is a colonial-styled church and monastery located in Quito, Ecuador. Construction of the building began a few weeks after the founding of the city in 1534 and ended in 1604. The founder of the church was Franciscan missionary Jodoco Ricke. Plaza San Francisco ( Church and Convent of St. Francis ) in the Historic Center of Quito. Courtyard of the Church of San Francisco. The Basilica of the National Vow, a Roman Catholic church located in the historic center of Quito, Ecuador. It is sometimes also called the Catedral Consagración de Jesús or the Basílica de San Juan. It is the largest neo-Gothic basilica in the Americas. Ecuador is a country of variety. Its climate and landscape varies from one end of the country to the other. However, it is more hot and humid along the coast and in the Amazon jungle lowlands than it is in the mountains. Darwin's Arch at Darwin Island in the Galapagos. Puerto Ayora at night on the Island of Santa Cruz in the Galapagos Islands in Ecuador. Fresh Water Swimming in Puerto Ayora, Galapagos on the Island of Santa Cruz. Ecuador is one of 17 megadiverse countries in the world. In addition to the mainland, Ecuador owns the Galápagos Islands. This is what the country is best known for. Ecuador has 1,600 bird species and 38 more endemic in the Galápagos. In addition to over 16,000 species of plants, the country has 106 endemic reptiles, 138 endemic amphibians, and 6,000 species of butterfly. The Galápagos Islands are famous as the place of birth of Darwin's Theory of Evolution. They are a UNESCO World Heritage Site. Many different kinds of potatoes and corn are grown in Ecuador. There are also large banana farms. On the coast, many people eat seafood and fish. Cuy is a famous indigenous food that means guinea pig. Besides gold, oil is one of Ecuador's natural resources. Ecuador used to have its own currency called the sucre, which was in use from 1884 until 2000. Since then, the country uses the United States dollar for money, but its coins (not the banknotes) are different from those in the US. Seal with baby on North Seymour Island. Iguana on the beach at the Charles Darwin Research Station. (Amblyrhynchus cristatus), Marine Iguana on Tortuga Bay - Island of Santa Cruz. (Amblyrhynchus cristatus), Marine Iguana swimming in Puerto Ayora - Island of Santa Cruz. ↑ 1.0 1.1 (PDF) World Factbook. 2008 revision. CIA. 2011. https://www.cia.gov/library/publications/the-world-factbook/geos/ec.html. Retrieved 2011-08-18. ↑ "Ecuador entry at MW.com". Merriam-webster.com. Retrieved 2012-02-24. ↑ "Ecuador Sets 2017 Election Date, Marking Correa's Last Year". telesur. 19 February 2016. Retrieved 18 December 2016. ↑ "Preliminary result of Ecuadorian census held on 28 November 2010". Government of Ecuador. Archived from the original on 8 February 2011. ↑ 5.0 5.1 5.2 5.3 "Ecuador". International Monetary Fund. Retrieved 2011-04-21. ↑ "Ecuador Facts & Statistics". Ecuador Explorer.com. Retrieved 30 October 2013. ↑ Mothes, P.; Biggs, J.; Baker, S.; Hong, S.; Amelung, F.; Dixon, T. (December 2008). "Survey of Volcanic Activity in Ecuador using L-band SAR". American Geophysical Union (#V51C-2055). http://adsabs.harvard.edu//abs/2008AGUFM.V51C2055M. ↑ "Ecuador". U.S. Department of State. ↑ "Ecuador - History, Geography, & Culture". Encyclopedia Britannica. ↑ "Censo de 2010" (in Spanish). Archived from the original on 22 July 2011. ↑ "Ecuador – Biodiversity Conservation" (PDF). Archived from the original (PDF) on 2006-03-23. Retrieved 2010-06-26. ↑ "Unesco World Heritage". Whc.unesco.org. Retrieved 2010-06-26.